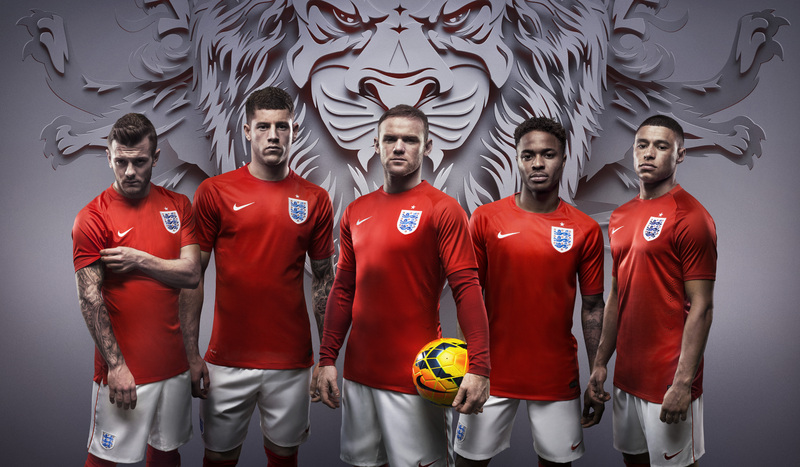 England and Nike unveiled new home and away kits for 2014, revealing designs that focus on English football history and culture, and carry the best in performance innovation. 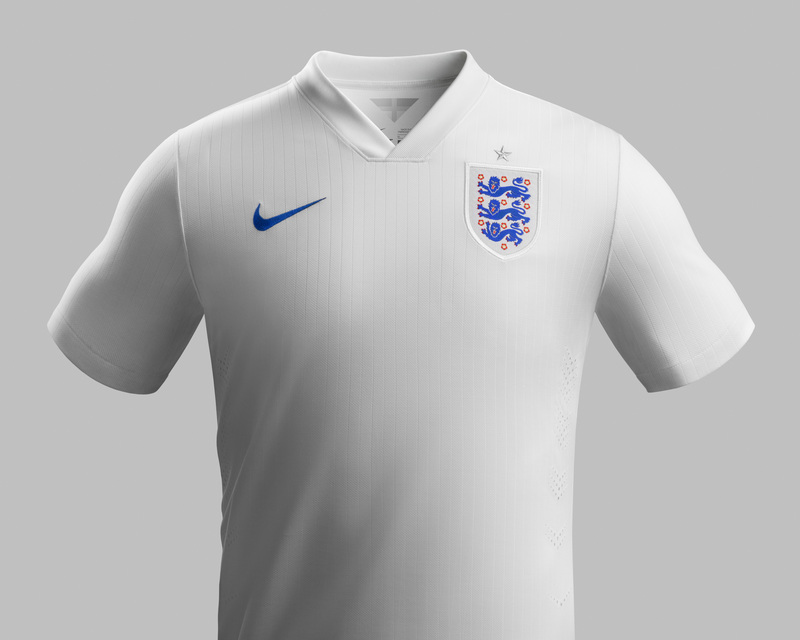 The new England home jersey is a pure and brilliant white with an engineered pinstripe in the fabric. White satin tape on the shoulders gives the jersey a distinctive shine. The famous three lions crest has a metallic weave to create another shimmering effect, most noticable when the crest catches the light. Inside the back of the neck is a pennant tab with a graphic of silver pinstripes that together create a St. George’s cross. The jersey has a modern V-neck collar, which is both functional and styled for sport. The fit of the shorts is slimmer and more tailored to the body, based on fit research and specifically cut to aid movement and comfort. The central back section of the shorts features Nike’s signature laser vents to aid in cooling and allow for moisture management. The new home socks are also white. The classic new England away kit celebrates the team’s history and showcases the most evocative national symbols in an innovative new fashion. 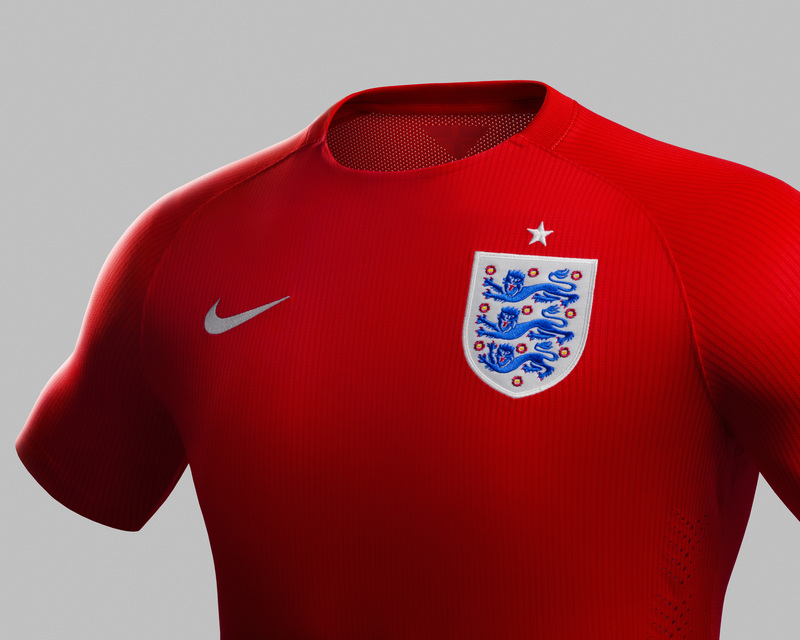 The new England away jersey features a bold red tonal pinstripe design subtly infused with a graphic interpretation of St. George’s cross on the front. The St. George’s cross, representing the English patron saint, is an optical illusion and cannot be seen up close, coming into focus only from a distance. 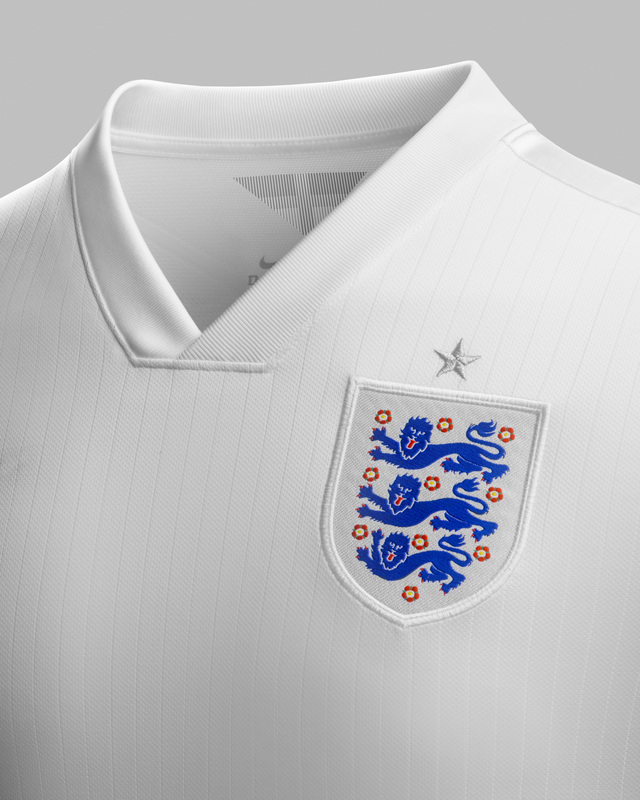 The iconic England crest features a satin weave base with embroidered lions to create a lustrous effect. The base uses a bright white with an optical brightener to further enhance its whiteness, making the lions come alive under UV light. 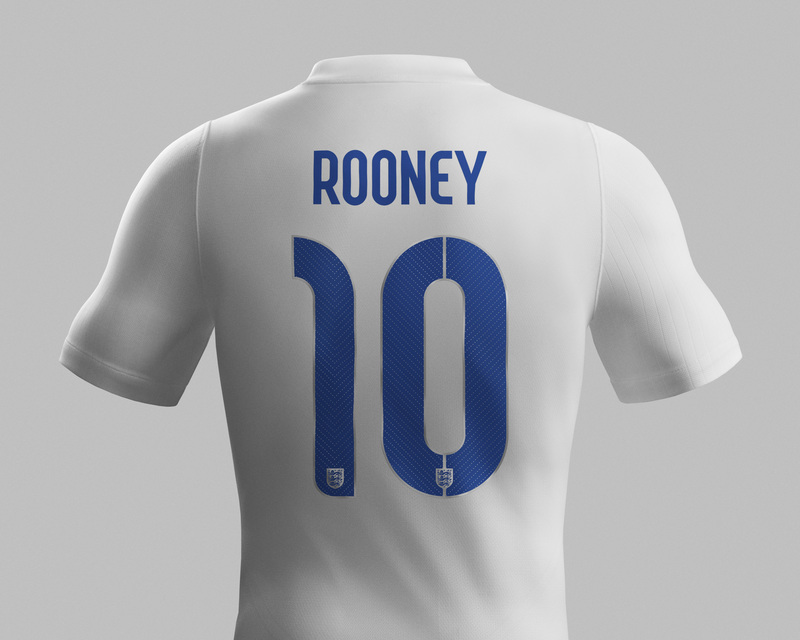 Inside the back of the neck, consistent with the home jersey is a pennant tab, this time with a graphic of red pinstripes that together create a subtle St. George’s cross. The shorts are white with a red tape along each side, and the away socks are red. The kit aids performance by helping regulate player body temperature over the course of a match. By using a combination of Nike Dri-FIT technology, mesh panels and laser-cut ventilation holes, designers are able to localize cooling where players need it most. 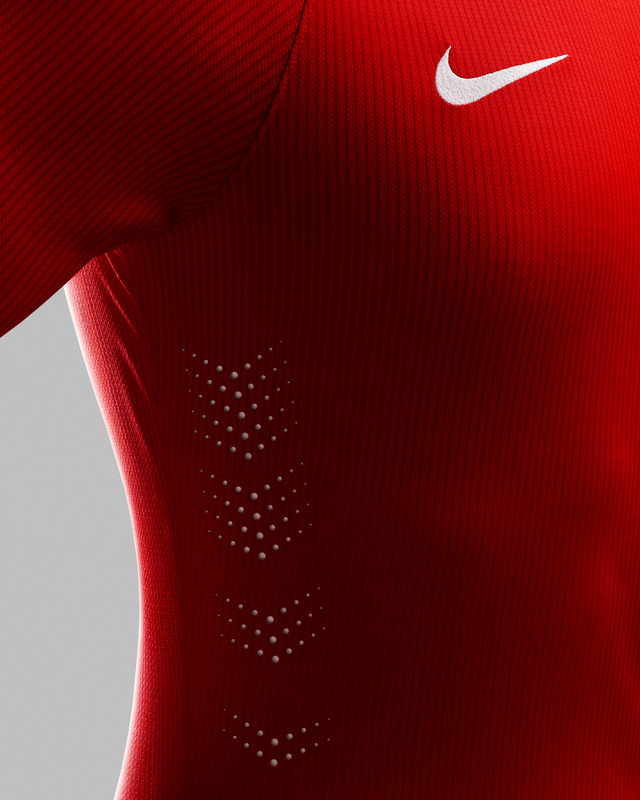 Nike Dri-FIT technology pulls moisture away from the skin to the outside of the garment where it evaporates quickly. 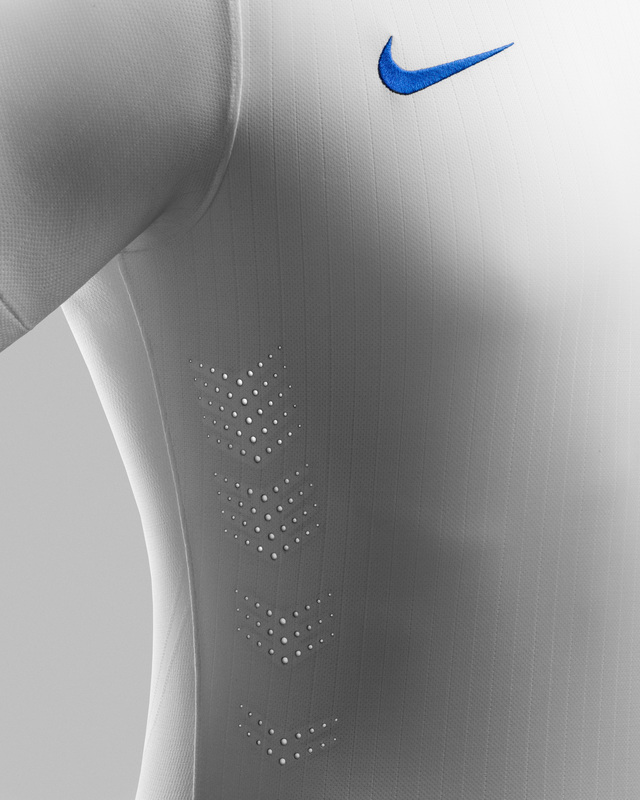 Laser-cut ventilation holes and engineered mesh in key areas allow for increased breathability and airflow across the skin. In addition to helping players stay cool, the kit is made with a new dual-knit fabrication that incorporates cotton and recycled polyester for the best in moisture-wicking properties, while adding a softer feel and more flattering shape. 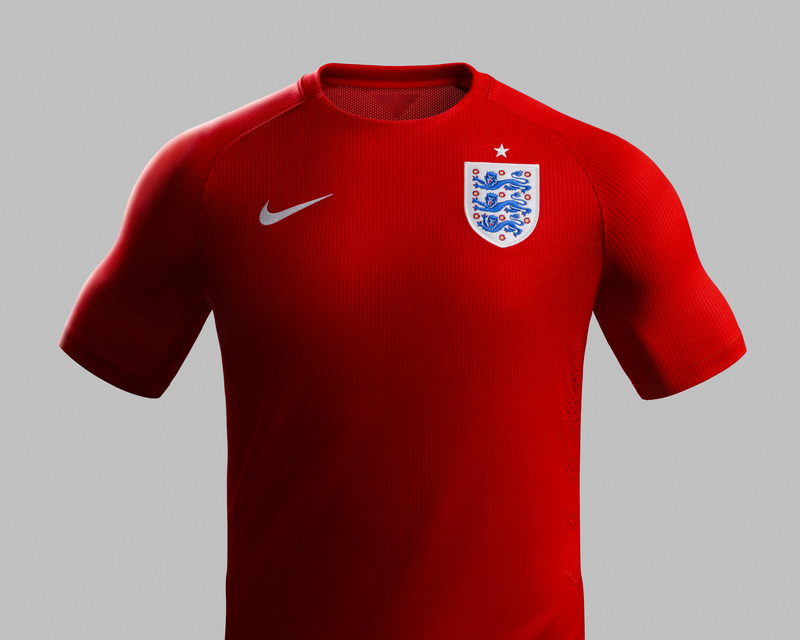 In line with Nike’s commitment to superior performance with lower environmental impact, the shirt, short — and for the first time in a national team kit, the socks — all feature fabric made from recycled plastic bottles (100 percent recycled polyester in the shorts, 96 percent recycled polyester in the shirt and 78 percent in the socks). Each kit is made using an average of 18 recycled plastic bottles. Since 2010, Nike has diverted almost two billion bottles from landfills, enough to cover more than 2,800 full-sized football pitches. 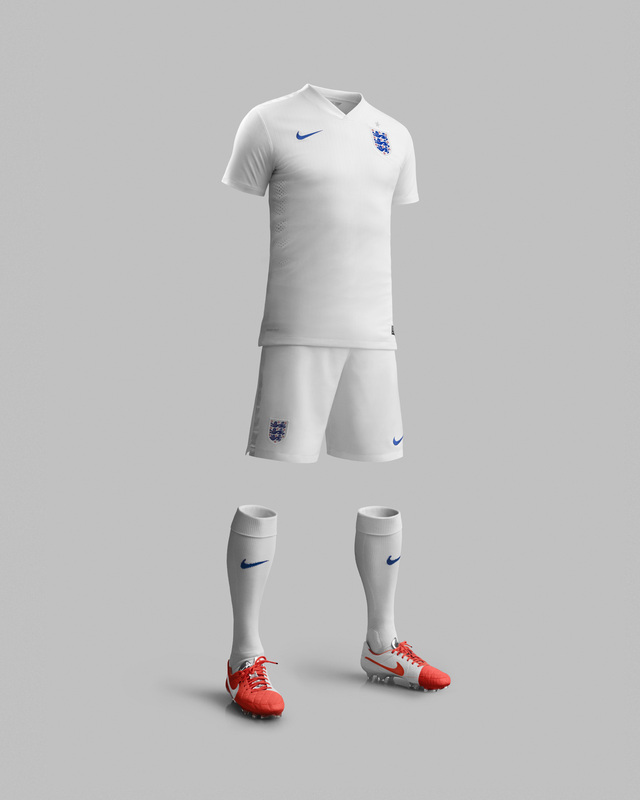 Designers utilized three-dimensional body scans of elite footballers to collect data on the form of today’s players and identify an updated fit, improving comfort and allowing the body to move more naturally within the kit. While looking at every element of the modern football kit, Nike designers even paid special attention to the kits’ socks. Combining athlete insights and research with new materials and fabrications, the Nike Elite Match Fit sock for 2014 features a sleeker fit specific to football. Strategically cushioned zones provide comfort and protection at the big toe and anklebones where the majority of impact occurs, while arch support locks down the foot to help prevent slipping. Material was also eliminated to enhance touch and decrease bulk, and flex grooves were added to the ankle and the top of the foot to prevent bunching. 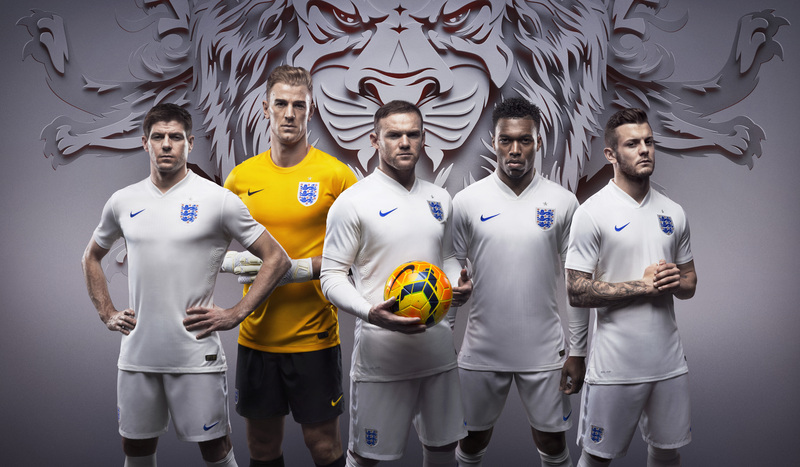 The England home and away kits are available to pre-order on nike.com from March 31, and on sale in stores and nike.com worldwide from April 3. 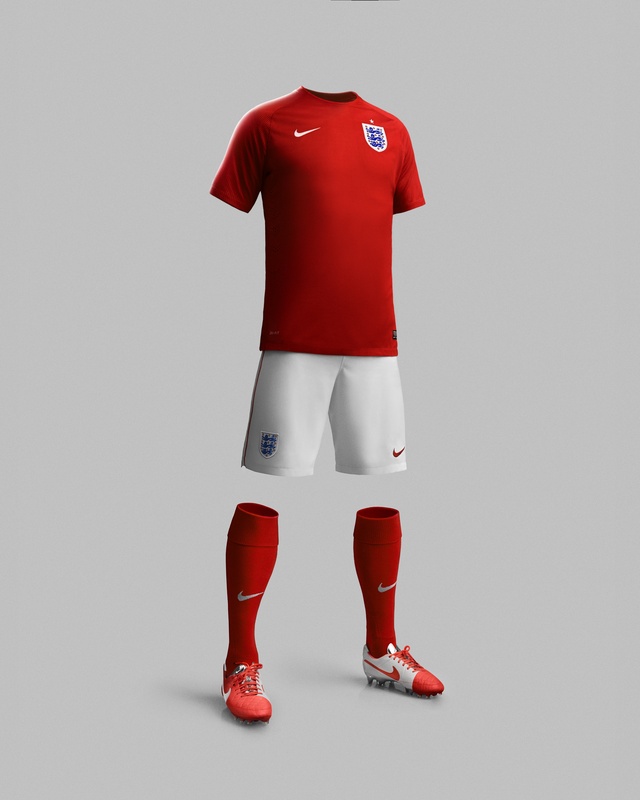 What do you think of the Nike England home and away kits for 2014? Let us know in the comments section below or on our Twitter and Facebook pages. A pair of Pantofola d’Oro Lazzarini Deluxe football boots arrive at Sport-Locker HQ!